Collagen is a natural protein that gives our face structure. Fibres of collagen weave together to form a framework (matrix) in which new cells can grow. We lose up to 1.5% of collagen a year from age 30. Supplementing with collagen may firm and plump facial tissues, helping to smooth wrinkles. This formula provides the highest concentration of pure marine (non-shark) collagen which is hydrolysed (broken-down) for easier and more rapid absorption of the key amino acids proline and hydroxyproline. It also contains Centella asiatica, which assists new collagen formation; Vitamin C which aids collagen synthesis and tissue renewal; together with MSM and other key nutrients for youthful skin. 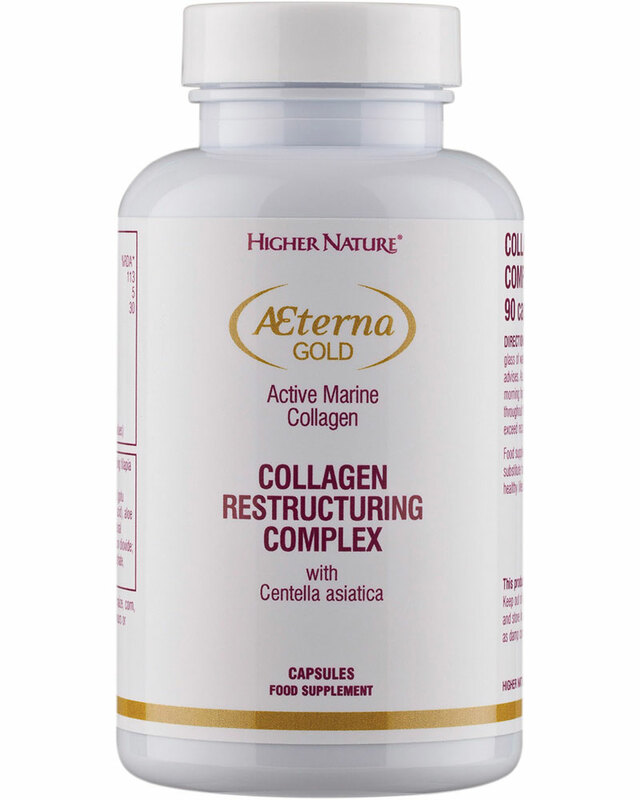 Best used with Æterna Gold Collagen Crème Serum. Encapsulated with these natural ingredients: Hydroxypropyl methylcellulose (carrageenan, pectin), vegetable magnesium stearate, silicon dioxide, vegetable stearic acid. Three capsules provide 1200mg marine collagen (non-shark), 150mg MSM, 90mg vitamin C, 75mg Aloe vera 200:1, 210mg Centella asiatica 4:1 extract, 30mg Chlorophyll, 30mg Horsetail, 3mg Zinc, 0.75mg Iron, 0.375mg Copper. Take 3 capsules before bed with a glass of water. As an optional extra, also take 3 in the morning for the first month. Drink 1-2 litres of water throughout the day to optimise results.